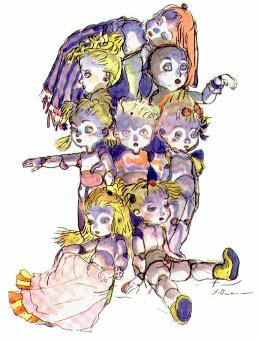 Calcobrina (カルコブリーナ [calcobrina] in Japanese) is a malicious doll fused out of four Calco and four Brina dolls in Final Fantasy IV. The Calco and Brina dolls belong to Luca, the princess of the dwarves, but whether this function of fusion is known to her is unknown, or if they can even do that without the help of a person with unkind intentions (such as Golbez). HP: 8,814, MP: ?, ATK: ?/M?, DEF: ?/M?, EVA: ?, SPD: ?